Last week, Financial Friday featured Federal Work Study as a way of reducing the cost of college. Its most attractive feature may be that it’s a type of financial aid that involves zero debt, which makes it one of many great ways to implement this week’s advice: Only borrow what you need to borrow now, and only owe what you need to owe later. It has become quite clear now that, in terms of student loans, we are the most indebted generation this country has ever seen. 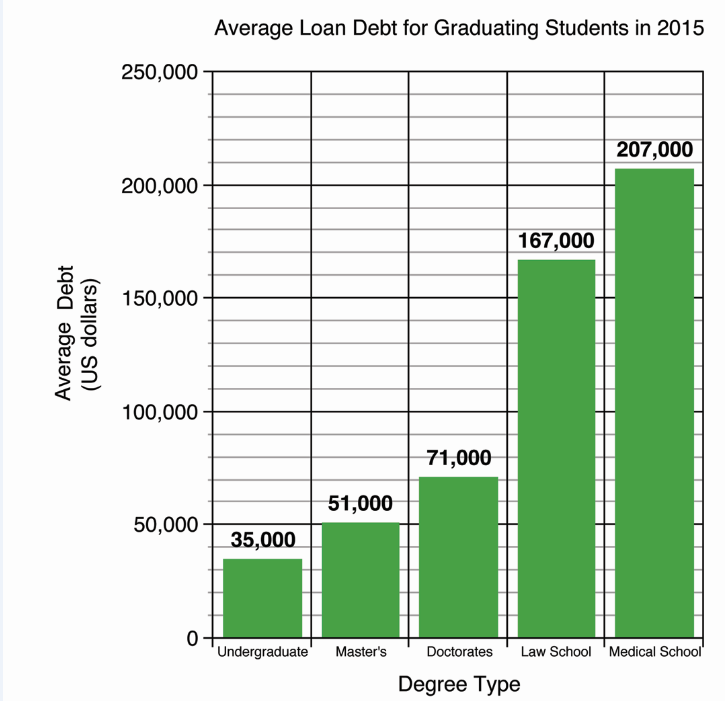 According to research by Mark Kantrowitz of Edvisors ¬– a site dedicated to informing students about planning and paying for college – the average student graduating with loans in 2015 did so with a little more than $35,000 in debt. That number should seem high, but if it doesn’t, it jumps to $51,000 for recipients of master’s degrees, $71,000 for doctorates, and a shocking $167,000 and $207,000 for law and medical school degrees, respectively. So if you plan on attending school for more than four years, that number will only get more intimidating. The same research also shows that student debt is not only increasing in amount, but also in ubiquity. Seventy-one percent of 2015 graduates exited school with some form of student debt. That number was 64 percent in 2005, and below 50 percent 20 years ago. With this data in mind, there’s a higprobability that the issue of how much to borrow is relevant to you. At this point you may be asking, “I can’t change the tuition or living expenses I have, so what does ‘don’t borrow more than you need to’ even mean?” And that is a good point. The major expenses that go along with attending college (tuition, room and board, etc.) are what they are, and if you’re reading this article as a student, there’s not much you can do to change that. But you still have the power to borrow a lower amount of money. One of the most important ways of accomplishing this is by simply knowing your expenses, a task more easily said than done. Making sure you only owe what you need to owe is equally as important as only borrowing what you need to borrow. While these two statements seem almost identical, they actually do contain different implications. If you are still choosing loans, you should review all the options you can and closely analyze the most important aspects of your loans. It can lead to owing less after school, despite borrowing the same amount that you might have signing a different loan. “Carefully review the terms [of the loan],” McLaughlin suggested, emphasizing the loan’s interest rates, whether it is variable or fixed, and its tax incentives. These are as especially important matters to review. Additionally, one of the biggest ways to cut down on the amount you need to borrow is, simply put, to make money you won’t have to pay back later. Last week’s topic, Federal Work Study, is a prime example of this, because it pays out thousands of dollars in aid for part-time work and has no element of borrowing. But scholarships usually come to mind before work-study. Whether Pitt gives you financial aid, either because of need or merit, and whatever that amount may be, has probably already been decided. But myriad forms of outside scholarships exist, and if you are willing to put in the time to fill out applications and write essays, you may find another way to put a significant dent in the amount you need to borrow. Minimizing the amount of money you borrow when signing a loan can make a huge difference when you finally receive your degree. Outside scholarship searches, along with other cost-reducing methods mentioned in this article-such as budgeting and finding the best loan-are all excellent ways of reducing the amount that you need to borrow, and they will all be covered in greater depth in later Financial Fridays. So stay tuned.